There was no pre-breakfast programme on account of last night’s outing, so at 8:30 we drove roughly westwards. Shortly after the common fiscal (shrike) we arrived at an area of scrub with trees laden with sociable weaver nests. Two Kalahari scrub robins cocked tails as they fed on the ground and there was a spotted thick-knee tucked under a bush. We turned left at a sign for Galton Gate (which pleased Jeremy of the same name), soon finding a magnificent martial eagle standing on a prey item. It soon became apparent that the prey was a ground squirrel, which the eagle ripped apart and ate. Beyond there were two-banded coursers and in Darrin’s bus we later stopped by a closer courser by the road’s edge. 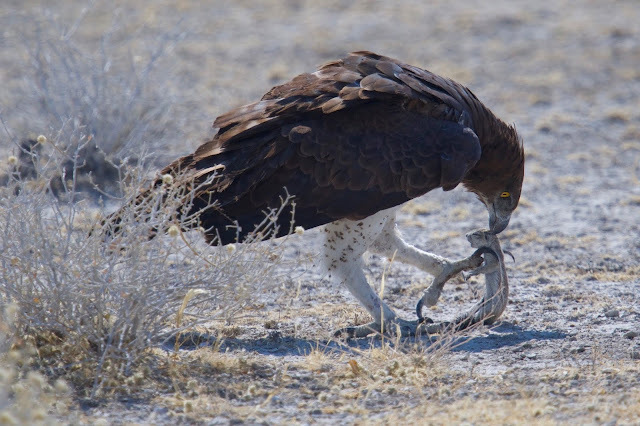 Martial eagle with ground squirrel prey (Tim Hunt). The route took us through mopane scrub sprinkled with the distinctive shape of moringa trees, like an upturned root vegetable, reminiscent of a baobab. The first flush of oval leaves was just appearing. 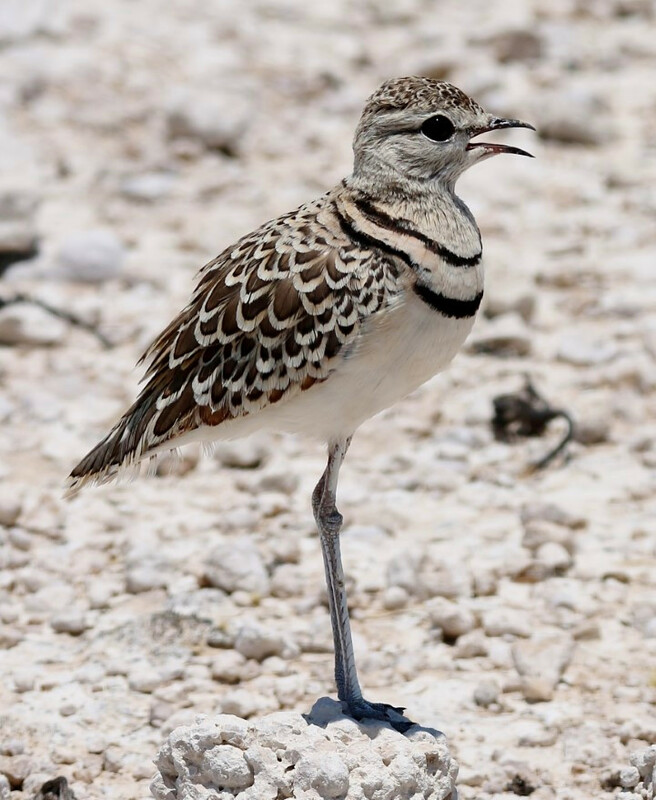 Farther on we studied a Stark’s lark. The return route went north via Etosha Pan, including loos within a fence, where there were many wildebeest in line-up of mammals similar to yesterday’s visit, plus two secretary birds tucked in behind a dense crowd of springboks. Etosha Pan stretches into the distance; mammals gather by the freshwater spring on its edge. Every tree that offered shade had a cluster of mammals; one group in a shadow was a pair of gemsboks with a very young calf. Back at base, the Geoff Crane sandwich-making service went into action again. Gemsbok (southern oryx) family in the shade. We returned to various waterholes on the afternoon drive. 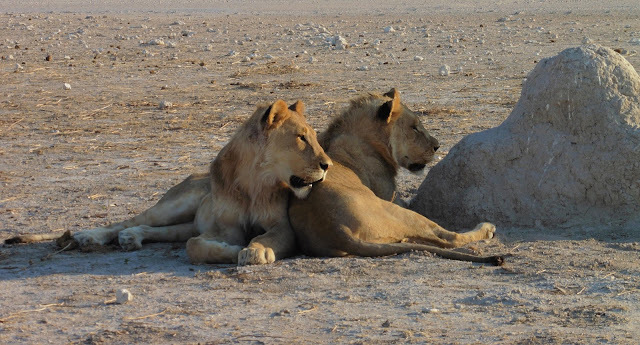 Initially they were quiet with lions asleep, apart from the one that got up to – it’s hard to put this delicately – have a crap and lie down again. But as the evening light kicked in the three bachelor lions started to move. 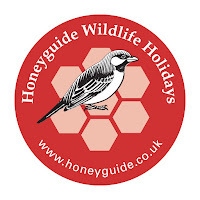 We also enjoyed excellent views of delicate Burchell’s sandgrouse and several perched birds of prey on the return journey. After dinner and checklists, rhinos were back at the camp waterhole along with at least ten flying nightjars. From the sociable weavers’ nest, there was a constant squeaky sound – like ‘Sooty & Sweep’, as Helen observed.